3. If he likes it, we will walk him a lot – to Prospect Park on weekends, and with others on our regular walks on weekdays. We’ll even let him off leash if you’d like us to (and we've gotten to know him well). 4. If he prefers to relax, someone will be home at all times and he’ll never be alone. He’ll also be able to play in our yard. 5. 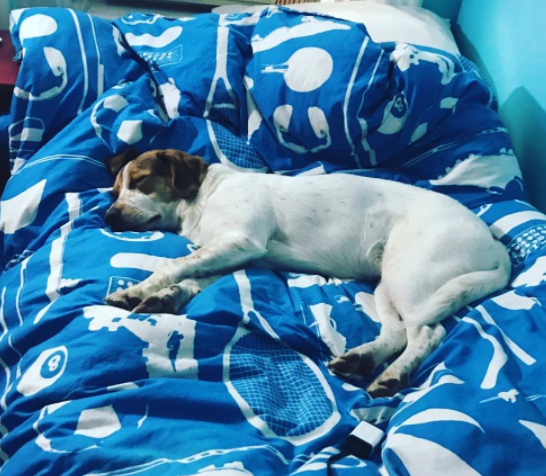 Your pooch will sleep wherever he wants: on our couch, beds, or on any bedding/crate you provide. We love to spoil our dog guests! 6. We’ll feed your dog the food you provide us, or our kibble with chicken broth and rice. 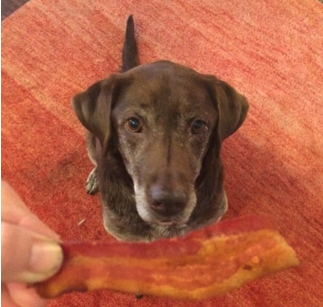 With your permission we’ll also give him bacon for breakfast. 7. You’ll receive a note about your dog’s stay, with pictures and a GPS map of where we went – once every 24 hours. 8. There will most likely be other dogs there to play with. (Though we never have more than 4 at a time, and make sure their personalities match.) We’ll play and love your dog like he was our own! Everyone on our Team is trained in Pet First Aid & CPR, and general dog care.